June is my birth month and I have a deep love for all things sweet and summery, so I was super thrilled to find out that this month’s Iron Cupcake theme is Summer Berries! There are four main summer berries that come to mind (strawberry, blueberry, raspberry and blackberry) and I’ve planned a cupcake for each one. Let’s meet our first contender! I wonder what those things could be? Since I had a decent amount of strawberries left over from my latest frozen creation, I decided to do the sensible thing and make my strawberry cupcakes first. Instead of making everything in the cupcake strawberry-flavored, I decided to provide a little variation by revisiting my theme of boozy cupcakes, and flavored the cake itself with a wonderfully fruity Rosé. I also macerated some small strawberry halves in a few drops of the wine and a sprinkle of sugar, then popped them in the middle. I wanted to keep everything light and fluffy as possible so I skipped the butter, choosing to use a pure meringue frosting to top these cupcakes. I love big fat frosting swirls! Let’s get closer and see what else is going on. I was really excited to make a strawberry cupcake because in my little idea notebook I have a page of general flavor pairings I wanted to try and one included strawberry. Strawberry and pink peppercorns, to be precise. I can happily say that I tried this combination, loved it and can now cross it off! Use more sparingly than sprinkles! I was originally going to crush the peppercorns but they’re kinda sticky on the inside and don’t really…crush. But, since they’re not really pepper to begin with, eating one whole (even on its own) is no big deal. They’re intense, but sweet and fruity with a hint of spiciness. These cupcakes are lovely and a real treat for any fan of fruit and wine. The frosting is a little runnier than my previous meringue-only frosting due to the amount of strawberry puree required to give it as much strawberry flavor as I wanted, but it held up great to swirling with a large round tip, in a dollop-y fashion. 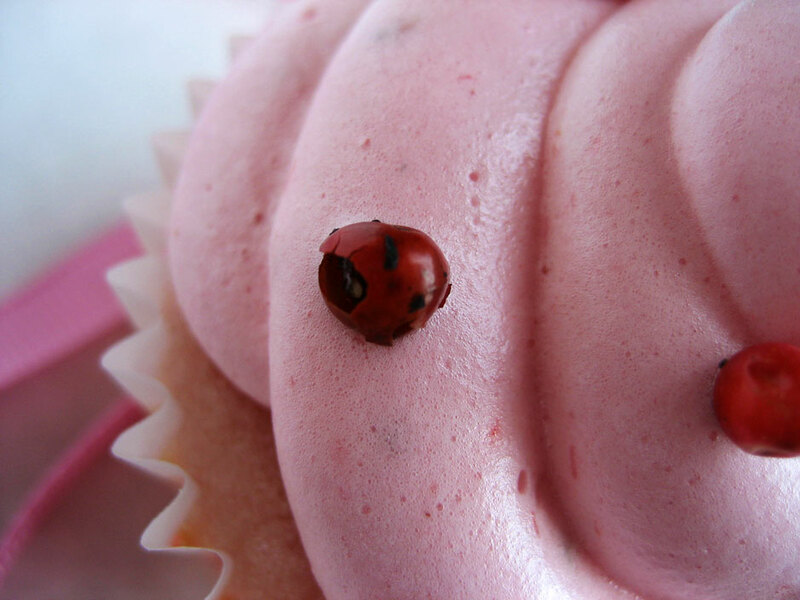 I dare you to find a pinker cupcake than this! Preheat the oven to 350. Sift together the flour, baking powder and salt, set aside. In the bowl of a stand mixer or with a handheld electric mixer, cream the butter, then beat in the sugar until light and fluffy. Add the dry mixture and the wine alternately, in thirds. Once well combined, beat in the vanilla and turn the mixer up to medium-high, then beat in the eggs. Beat for a couple minutes, until the batter is somewhat fluffy. Turn off the mixer and add a drop or two of food coloring, then quickly incorporate on medium speed. It should be a baby pink color but not too pink. Pour into lined muffin tins (fill 3/4 full – do not overfill) and bake for 12-15 minutes, until a toothpick inserted in one of the cupcakes comes out clean, but before the cakes start to brown. Allow to cool fully before filling or frosting. Makes 9 regular-sized cupcakes. Cut the strawberries into 9 heart-shaped equal pieces. Arrange in one layer in a bowl and splash with the wine. Sprinkle the sugar on and refrigerate for a couple hours. Once the strawberries have macerated, place a piece of strawberry in the middle of each cupcake, using the cone method and trimming the top cone as necessary to fit the berries inside (mmm, cake scraps). Place the whites, sugar and cream of tartar in a double boiler over simmering water (ideally right in the metal bowl of a stand mixer so you can transfer it to whipping easily). Whisking gently but constantly, allow the sugar to dissolve (let it come to 160 degrees if you are concerned about eating raw eggs – you will kill any potential bacteria at that temperature). Move to a stand mixer and whip the whites on medium-high until the mixture is room temperature and forms soft peaks. 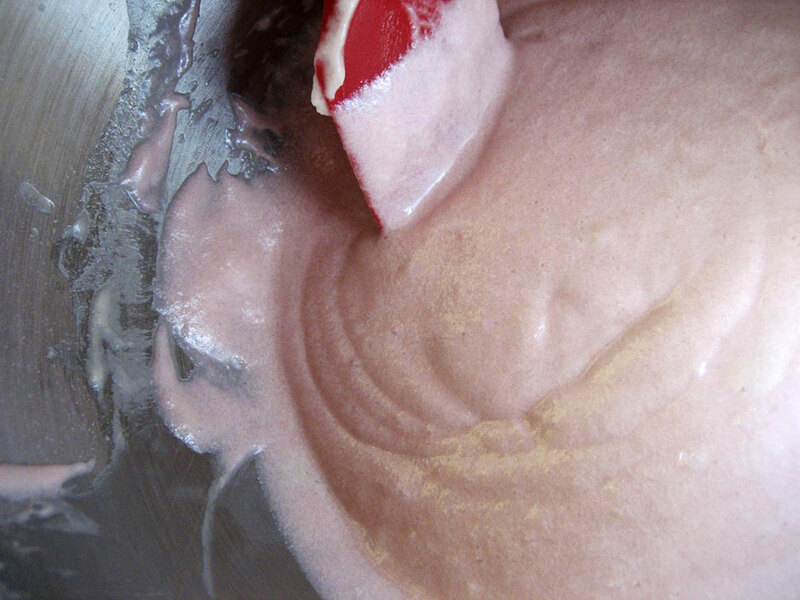 Turn the mixer off and add a third of the strawberry puree, then mix it in on medium. Repeat until flavored to your liking (if you add too much it will get runny so be careful). Drop in the food coloring and mix on medium-low briefly to intersperse it evenly throughout the meringue. Fill a pastry bag fitted with a very large round tip with half of the meringue and pipe it on the cupcakes in an even swirl pattern, refilling with the rest of the meringue about halfway through. Gently place a few (around 6) pink peppercorns on top of each cupcake, spreading them evenly so you get one or two in each bite. Very pretty. I love the shade of pink that the cakes turned out to be. 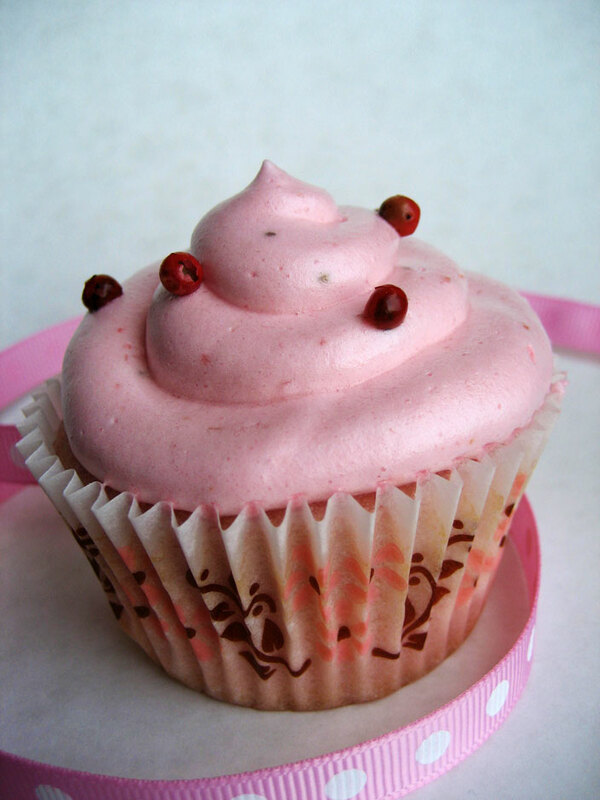 Love the pink peppercorns on the cupcakes. Fleur de Cocoa, one of my fave bakeries in Los Gatos, makes this incredible truffle called the “Julia Child.” It’s filled with ganache steeped with pink peppercorns. It’s so wonderful. Pink cupcakes? Awesome. 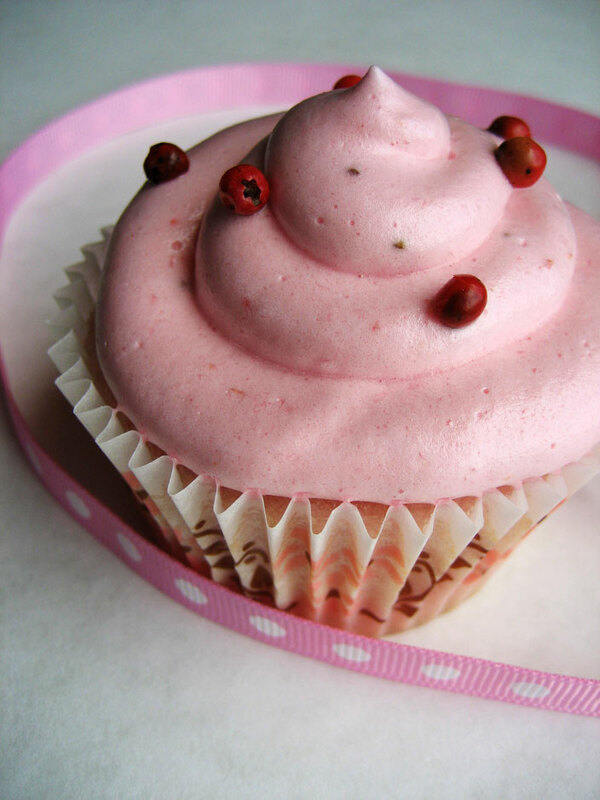 Love cupcakes, love pink, works for me! Great job! 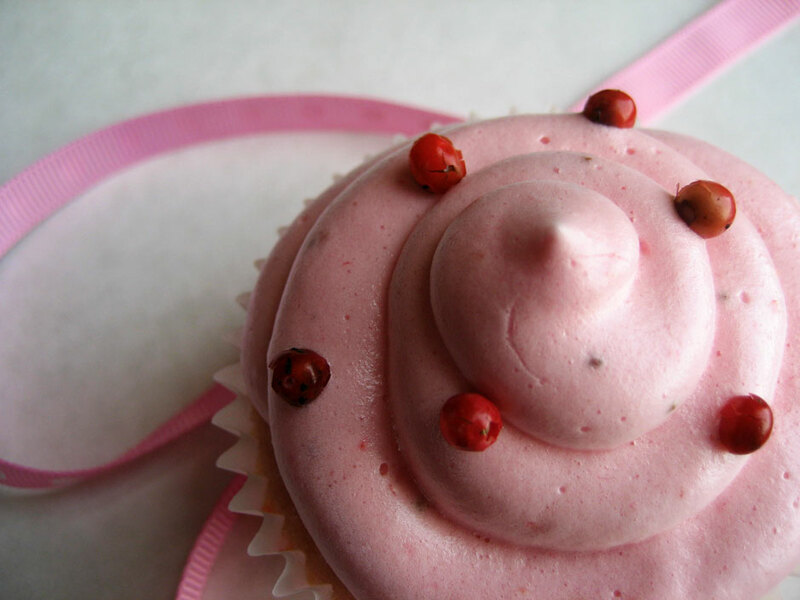 Love the way this cupcake looks and think the strawberry/pink peppercorn pairing sounds intense and delicious! Very creative and looking forward to seeing your next three entrants. Gonna work on one of mine this weekend! I am trying to keep up with an overflow of raspberries from our garden, and just this weekend tried raspberry buttercream on chocolate cupcakes. 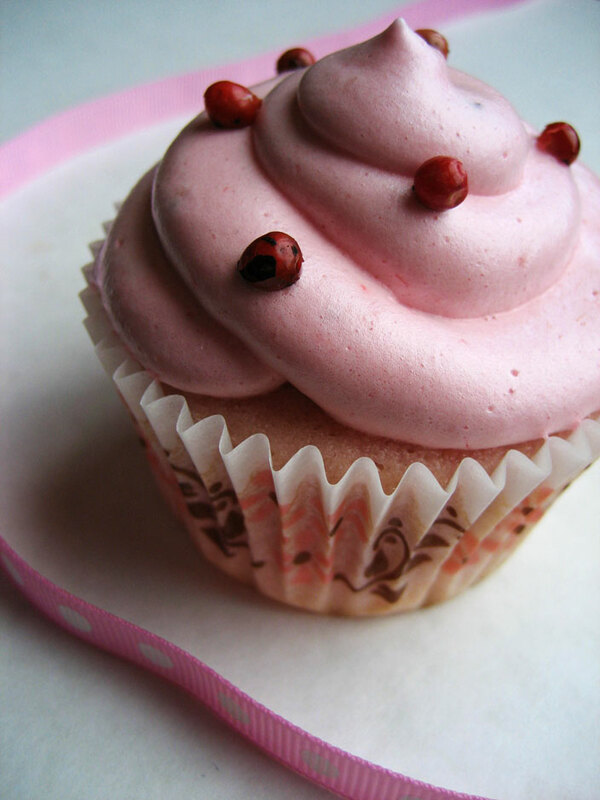 Same thing happened to the buttercream as to your meringue: a little on the soft side from the raspberry puree. I think it could be fixed in my case with more confectioner’s sugar, but I wouldn’t want to dilute the beautiful color or crystal clear raspberry taste. So, I used the fridge to help me keep the frosting on the cupcakes firm.